Is your Company equipped to handle the challenges faced by many Bioequivalence organizations in today's global environment? The challenges faced by Bioequivalence organizations across the world are many. Tight study deadlines measured in weeks (versus months), Silos of Information, Large volumes (Terabytes) of Data have led to high levels of Regulatory and Productivity stress. Adding to the challenge is the growing need for BE organizations to deliver hundreds of studies per year, up from only a handful of studies per year a few years ago. Current efforts vary from manual paper based systems to point based solutions that address part of the needs. Megaware's Lab Informatics Automation System for Bioequivalence (“LIAS for BE”) is a web-enabled enterprise software platform for CROs and Pharmaceutical companies performing Bioequivalence studies. LIAS for BE addresses virtually all of the key requirements of a Bioequivalence organization; from Volunteer Registration, Protocol Management, Study Management, all the way to Documentation and Reporting. Wherever appropriate, the solution provides integration with best of breed third party applications, allowing customers to leverage their current investments and preferences. LIAS for BE, with its highly configurable approach has been designed to allow frequent changes to the deployed solution. 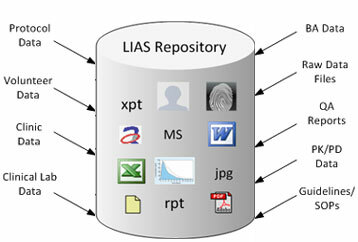 Organizations can configure the LIAS solution to fit its processes and workflows. Changes can be made on the fly to the deployed solution without affecting the back end – thereby resulting in a minimal validation impact.